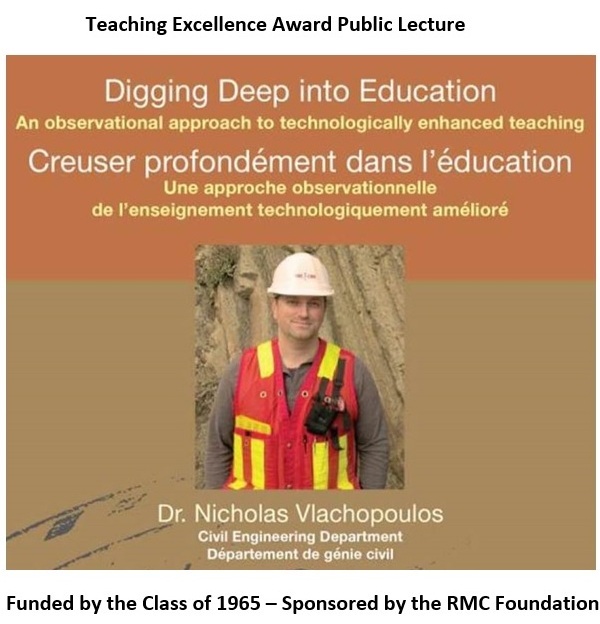 19930 Dr. Nicholas Vlachopoulos (RMC 1995) will give this year’s Class of 1965 Teaching Excellence Award Public Lecture MONDAY, OCTOBER, 29, 2018, at 1900 in Currie Hall. As this is one of the most well-known and prestigious academic awards at RMC, I sat down with several of those involved behind the scenes to understand how it got its start and just what it is that makes it so special. 6588 Stephen Arnold at last year’s Public Lecture. 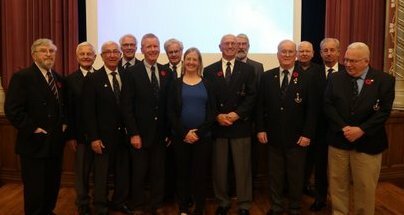 Stephen stressed that while the process of choosing the recipient has changed some over the years (the Committee is currently updating the Terms of Reference once more) the standards expected of the recipients haven’t changed. 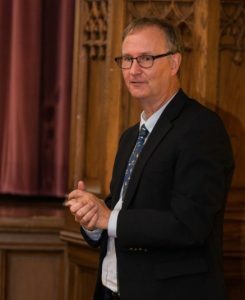 “The purpose of this is to recognize excellence in teaching,” he emphasized. The award itself is, broadly speaking, open to anyone involved in a teaching role at RMC. (It should also be noted that CMR St. Jean has its own award as well.) “The only restriction is that once an individual has won the award they are ineligible to win for the next seven years,” Stephen explained. 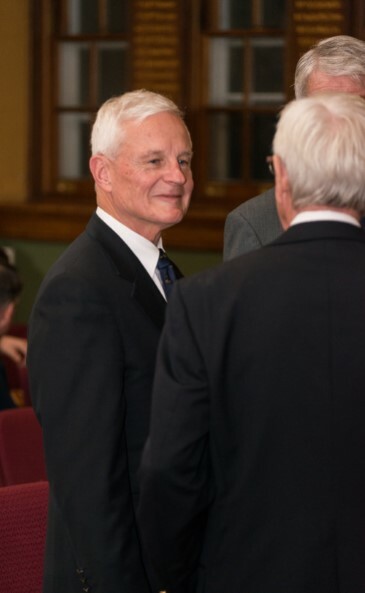 The process beings with the Selection Committee, which at present includes three professors from the College (today these are all past recipients of the award themselves), two to three Cadets, and a representative from the Class of 1965. 6496 Charles Emond is currently in his seventh year in that role. The Committee will put out a call for nominations early in the year, review and discuss them, and then forward the result to the Principal who announces the recipient at Convocation in May. The recipient then has to give the Public Lecture during the Fall Term. Members of the Class of 1965 pose with Dr. Jennifer Scott at the 2017 Class of 1965 Teaching Excellence Award Public Lecture. Dr. Phil Bates, RMC Vice Principal Academic, at last year’s Public Lecture. If you’re in the Kingston area, don’t miss out on Dr. Nicholas Vlachopoulos giving this year’s Class of 1965 Teaching Excellence Award Public Lecture MONDAY, OCTOBER 29, 2018, at 1900 in Currie Hall! Keith put together and chaired the original Class of 1965 Gifting Committee and subsequently hosted class mates on several occasions at his summer home near Kingston. It was not only to have a class get-together but to ask for contributions to the class gift. He has subsequently served for nearly thirty years as the chair of this committee.